There are times when I am not quite sure why I decide to read a particular book whether it is fiction or nonfiction. One of the reasons I wanted to at least look into this book though was because it has to do with apologetics, which I love to read, as well as the challenge it brings in my walk with the Lord. I know, too, that there is always room to learn more, to be better equipped and therefore ready to answer inquiries. When I saw the book, I can say that there was concern that a very liberal approach was possibly being advocated for women by women again. Nothing saddens me more when women either intentionally or not fall prey to thinking we have “rights” to everything without remembering that we are crucified with Christ. Our lives aren’t about “rights”, but about serving the Lord as we are ambassadors for the very One who came to serve not to be served. Sometimes we fall prey due to lack of devotion to the Word of God, studying it, reading it and doing it again the next day. There are some ways my past is similar to the author’s and other ways it is very different; perhaps other readers will find this true for themselves as well. 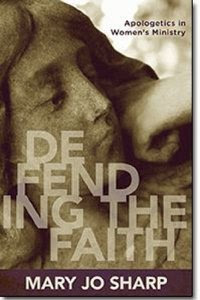 The author states that, “the goal of this book, in which I am, essentially, arguing that Christian women need to be able to defend their faith with intellectual rigor and honesty.” (pg 11) The challenge is not new, but a wakeup call to the church to remember a command in the Gospel of Mark 12:30 “Love the Lord your God with all your heart and with all your soul and with all your mind and with all your strength.” I agree with the author that women need to be able to defend their faith, not in a mean or argumentative way, but seasoned with grace. In other words, we learn how to defend our faith in order to help others see Jesus, know Jesus and seek Jesus. Mary Jo Sharp has written a very concise and thought-provoking book that should be read with the mind as well as the heart. It will challenge, encourage and definitely cause readers to evaluate their walk with the Lord as well as their preparedness to answer inquirers. Don’t misjudge the length of the book, thinking that it won’t take long to read through. It will take some time if readers are marking and commenting in the book. I appreciate the author’s thoughts and her challenges!